(Bloomberg Opinion) -- Animal prints in muted tones on everything from flowing skirts to shoes are a hot look right now — and they’re out in force in Zara’s technologically advanced store in Westfield’s Stratford mall in east London. But its parent, Inditex SA, is finding it harder to stay ahead of the trends these days. 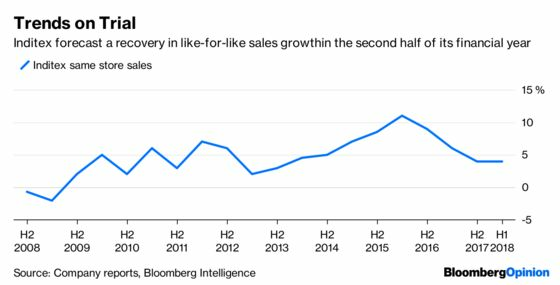 On Wednesday it reported the weakest revenue expansion in four years in the six months through July, though offered reassurance by forecasting that sales growth and profitability will accelerate in the second half of the year. That guidance is welcome, but looks optimistic for several reasons. Firstly, as I have argued, competition is rising. Primark’s cheaper takes on fast fashion, in increasingly sophisticated store environments, has made the Associated British Foods Plc-owned retailer a force to be reckoned with. This is not only in the discount sector — it’s a real issue in the mid-market as well. Though Hennes & Mauritz AB has been on the front line here, it’s also where Inditex’s brands operate. And it isn’t immune. Analysis by Morgan Stanley found that Inditex’s prices were down as much as 25 percent in some markets. That could well be a reaction to the discount players. The company is responding by putting showroom areas, which highlight the most high-fashion items from both the store and online, in a boutique environment in some stores, such as in Stratford, Tokyo and Milan. While that can help differentiate its offering from Primark’s cheap chic, it can’t stem the tide from the value onslaught. 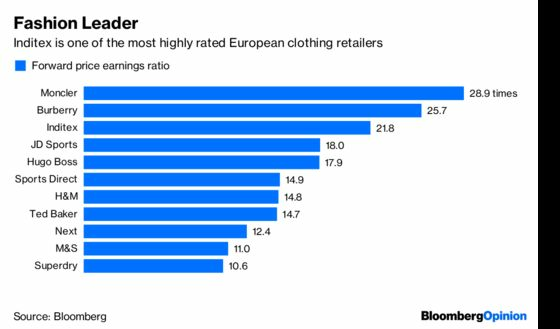 Secondly, while Inditex has been at a considerable advantage with its business model that can react quickly to changing trends, thanks in part to its strategy of sourcing about 60 percent of its clothes from Spain, Portugal and North Africa, others are catching up. Rivals from the U.K.’s Next Plc to U.S. retailer Kohl’s Corp. are also working to get trends into stores more quickly. And some British online players, such as Boohoo Group Plc and Quiz Plc, also source over 50 percent of their supplies in the U.K., cutting the time from design room to doorstep. 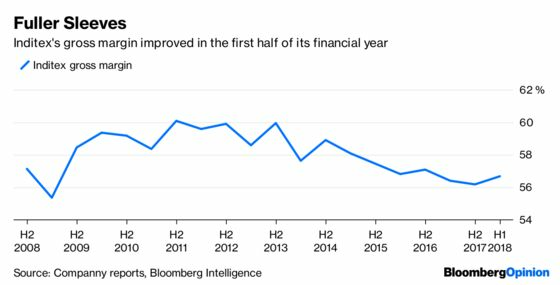 What is most surprising perhaps is that Inditex has been able to stay at the cutting edge for so long. Rivals still have a long way to go to catch up, but the increased challenge is unhelpful. Finally, the company’s centralized operations in Spain, and so-called “proximity sourcing,” means that it incurs the majority of its costs in euros, even though its revenues are increasingly coming from outside the currency bloc, according to according to analyst Geoff Ruddell at Morgan Stanley. That currency mismatch is becoming a bigger issue. Inditex is still a class act. It also deserves credit for adapting to the more challenging environment, opening fewer but larger stores, and integrating technology into its operations. This includes the introduction of radio frequency identification tags, so that it can, for example, fulfill online orders from stock in its stores. But life is becoming tougher, even for this superstar. The shares rose about 3 percent on Wednesday, but are still down about 9 percent since Morgan Stanley downgraded the stock to underweight two weeks ago. They trade on a forward price earnings ratio of just under 22 times, a premium to the average 19 times for rivals in Western Europe. But to maintain its leading valuation, Inditex will need to prove that it can see off the twin threats of online advances and discount rivals. Its historically superior performance and strong balance sheet is a good starting point. But this leopard is going to need to change some of its spots to continue to outperform.